Today I’ve my buddy Xiao Hui Wang on the show. 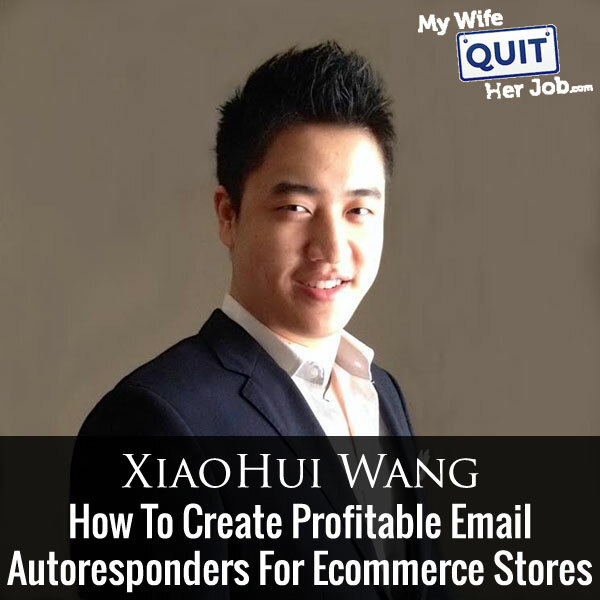 I met Xiao Hui at the Ecommerce Fuel live event last year and he definitely made an impression on me with his email expertise. X runs the site EssenceOfEmail.com where he specializes in email marketing specifically for ecommerce. Unlike email marketing for blogging, sending out emails for an ecommerce store selling physical products is quite different and requires an alternate approach. X is an expert when it comes to email marketing for ecommerce so I invited him on to teach us a few lessons. Should you use a personal or professional tone in your emails? Now before I begin I want to thank HostGator for sponsoring the show. HostGator is an incredible webhost that I highly recommend. And in fact did you know that mywifequitherjob.com was hosted on HostGator in the very beginning? They offer 24/7 live support via chat, phone and email, one click WordPress install, so you can literally install a WordPress blog in a matter of minutes. They have an easy to use website builder, design services, marketing services, and the best part is that I’m offering a 30% discount for all podcast listeners. So please go to HostGator.com/mywifequit to redeem the discount. Once again that’s HostGator.com/mywifequit. There’s also an incredible theme store where you can choose from a variety of attractive store designs, so you don’t really need to hire a designer. Everything from design to payment processing is all built-in, and you just have to populate it with your own products. So you can literally start your online store in a matter of hours. Simply go to bigcommerce.com/mywifequitherjob, sign up and you will instantly receive one month free. Once again the URL is bigcommerce.com/mywifequitherjob, now onto the show. Steve: Welcome to the My Wife Quit Her Job podcast, today I have got my buddy Xiao Hui on the show. But for some reason everybody refers to him as ‘X’ which sounds way cooler, so that’s what I’m going to call him today during the interview. Anyway I met X at the ecommerce field live event last year, and he definitely made an impression on me with his email expertise. Now X runs the site essenceofemail.com, where he specializes in email marketing specifically for ecommerce. Now unlike email marketing for blogging, sending out emails for a physical ecommerce store is quite different and actually requires someone different approach. So X is an expert in this realm when it comes to email marketing for ecommerce, so I invited him on the podcast to teach us a couple of lessons. And with that welcome to the show X, how are you doing today man? X: I’m doing fantastic, how about yourself Steve? Steve: I’m doing good and I understand that you are Romanian, and what’s really cool about your business– we were just beforehand is that, X actually travels to different parts of the world for like months at the time and just works there just because his business is entirely remote. So I find that really cool. But before we start X give us a quick background of how you got started with Essence of Email, how did you gain all your experience about running email campaigns for ecommerce? X: Yeah, absolutely, so real quick background on myself, so prior to starting this company which I started about a year and a half ago, a little bit more than that, I was working for about two years with a different agency in San Francisco, and we were doing the exact same thing ecommerce email. So that’s kind of where I learned the ropes of email marketing, and so if you add up the years it’s been kind of three and a half years just daily [scheme] and there’s particular channels of email marketing for ecommerce. So I have kind of seen the game in terms of different email programs from various different niches whether it’s apparel, whether it’s furniture, whether it’s supplements, anything under the sun as well as kind of the different sizes of stores from people who are just starting out all the way up to some aisle of 500 big bucks retailers. Steve: Well, so here is the question, so why did you decide to leave that firm, and how did you know that you could do this on your own as an independent company? X: Yeah, a great question, so it was a great company that I worked for, I was — I had great relationships with all my co-workers and boss and all that. Well, really I knew — I guess from an early age if you will, that I was just meant to kind of do the more entrepreneurial path or something like that, because it’s just kind of my personality and the way I am. I’m part of that networking group, you might have heard of it dynamos circle, basically a lot of location independent entrepreneurs. I mean they have annual meet ups similar to Ecommerce Fuel, and I went to one I think that was back in 2013. I got to get my year straight now. So it was the end of 2013, and I was talking to some people I was saying, hey I really want to get on my own, I really want to kind of try to do some long term travel as well as create a company. And actually from that conference I got my first two clients. So it kind of rolled from there, and I decided like hey, let’s just try this thing on my own and we are here. Steve: That’s cool, so how do you get your clients, I’m just curious in general? X: In general yes, mostly referral and very specific — people coming in from very specific like content we have. For example Ecommerce Fuel actually has been a good source just because every once the ecommerce store owner there. And what we’ve been doing, we actually haven’t been doing a lot of heavy marketing, which is something I should probably focus on too. But mostly we’ve just been putting out some good content around email marketing for ecommerce, and showing people different tips and specifics on how they can improve their programs. And then we’ve mostly been word of mouth to date. Steve: Yeah, because I know that, I first encountered you when you — on the Ecommerce Fuel forum you posted like this gigantic ten page thing on email marketing. I was like damn I have never seen anyone post such a long post on a forum before, and that’s what got my attention, I’m not sure if you’ve got any clients from that as well. But is that your strategy for getting clients, just putting content out there, getting yourself known, and then having people come to you? X: Yeah, absolutely I think on our side, the marketing is important for every business of course, but in our mind it’s really about delivering for clients. So right now we have our current clients, and we are more focused on stream lining our operations to make sure we are giving the most value there. And my philosophy is, you definitely want to do some marketing, but the same time the best kind of marketing is just satisfied clients, right? People are happy with the work you do, then they let other people know, especially in the space and a lot of other spaces, ecommerce store owners tend to also know other ecommerce store owners. So word of mouth has been pretty powerful for us. Steve: So what are some of the companies that you’ve helped in the past, do you have any success stories that you would like to share just to demonstrate kind of like the power of email? X: Yeah, absolutely and we work with kind of a variety of different niches, but I’ll just pull one of the recent engagements we just wrapped up with. And they sell — I won’t get into specifics of the product, but they sell kind of one type of product that’s very — it’s customized, but it’s not like a store that sells a bunch of different skills. And for them they had literally zero email marketing. And what we did for them is we implemented a couple of different auto responder sequences for them. And also on boarded their list which has been — it was — they have been in business for a few years, so they had a few thousand on their list, but they haven’t really sent any email out to them. So we pretty much took the list, cleaned up a bit and sent the first few campaigns out to get people rolling, in addition to auto responder sequences. And today it’s accounted for about 40% of monthly revenue. Just to do email channel since we got started, so it’s pretty powerful in terms of going from no email to having a program running. So and generally I would say like a target to shoot for, and it’s kind of a big range, but depending on your audience, anywhere between 10% to 30% of total revenue coming from the email channel is a good estimate. Steve: So all those of that 15% or whatever it was, what percentage of those are new customers, versus old customers, versus recovery customers? X: Yeah, absolutely so I don’t have the exact percentages in front of me, but I would say one of the more successful parts of that was the prospect series. So that one is geared towards new customers coming in, so we are targeting them primarily through on site overlays, so smart overlay capture forms that’s based on certain set of logics, so it’s not just popping up whenever someone first gets on. And that’s targeting people who have not purchased before and with that’s we’ve seen some pretty high conversion rates, I’d say in terms of the 14% not quite 50%, but maybe like 35 to 45 was coming from that. And then the rest are sequencers for repurchases etcetera. Now a caveat there is that usually, even though prospects series are quite powerful you usually will still view email as primarily a remarketing channel. So most of the time focusing on the past customers that’s where you’ll get the most bank for your book. Steve: Okay, so let’s go into a lot more depth about some of the things that you said, so let’s say from this scenario of a business owner, let’s say I’m one of your clients. And let’s say I have like 5,000 emails that I have just collected randomly, I haven’t done anything with them for a year. What would you advice me to do, and what sort of sequences should I focus on first? X: Yeah, absolutely, so first I would ask you, how did you collect those email addresses, most of the time the majority, the biggest portion of the list is going to come from past customers who sign up when they are checking out, right? So they have the checkout, at check out you have the ‘subscribe to our newsletter box’ and you are getting customers coming in from there. So let’s assume that’s the case where it’s mostly just past customers. The next step then is if they are a year old, it’s not as bad, but if they are several years, we will still probably go through the same process. But what I’m worried about is we can’t really use that entire list, because there’s going to be — the list is more or less cold as we call it, because we haven’t emailed them really sends, the oldest customers are like a year old. So what we would do is we would do a little bit of a list cleaning. There are several ways to go about that, the easiest way is probably to use a pay service. So there’s a couple of third party software where we can take your list and put it in and they’ll spit out kind of the bad email addresses, and we’ll keep ones that are good, so you can retain the portion that are good. And the reason to do this is of course to help your deliverability, making sure that you don’t have these bad addresses on your email list that make you get blacklisted, or have problems getting into the inbox. Steve: So you don’t recommend sending an email saying, hey I know we haven’t contacted you in a while, if you want to stay on this list click here type of thing? X: See we do want to do that, but this is a step before actually, because what this does is it will clean out the ones that say are email addresses that are typos for example. Or are just bad email addresses that have gone dormant etcetera, potentially spam traps on there. So afterwards then we will proceed to actual sending of the message, right? So then we will send out email saying, hey something like what you said, we haven’t really messaged you in a while, but we have — we are starting up the new email program with all these cool things going on, if you want to subscribe stay on the list. So that’s one way to do it, and another way is I guess maybe a little bit less cautious, but in terms of response rates it’s just playing on that psychology right? The checked box, pre checked box versus the unchecked box, kind of psychology. So instead of saying– because if the list the way you got the list was people already checking the box for example at check out, they are technically opted in already, right? So it’s more so just to make sure that you don’t want to opt out. In which case the way I would structure that email would be something like, hey we haven’t messaged you in a while, if you don’t want to be on our new awesome email program then click here to unsubscribe. And thus that should retain you — at least initially, and create a portion out of the list, than if you ask someone specifically for extra call to action to re-subscribe. Steve: Okay, right, okay, and so what’s the next step, I’m not sending out any emails and now I have this list that is kind of responsive. X: Absolutely, so let me just back track a little bit on, just a quick little high level thing and then will talk specifically on that. So basically at the high level we see email programs for ecommerce as two parts. One is of the automated emails so auto responders, the triggers, the sequences etcetera. And then two is the kind of regular manual promotional campaigns, so you are setting up and sending to the larger portion of the list. So to answer your question and those are the two parts you want to focus on. So I say number one, you want to just stab on the side of the badge [ph] campaigns. You want to establish some sort of calendar and stick to that calendar. So even if it’s like a once per month sort of send, the key is sticking to that and not just sporadically sending whenever you remember emails. So that’s one side, even if it’s like a newsletter or once a month promotion something like that they could all work. Start simple, start working, rather than running and have that calendar in place that you are following for the mass sends. Steve: Do you have a recommendation on email frequency for those marketing emails? X: Yeah, absolutely, so we would like — it varies depending on your audience and your product and how responsive they are. But on a general level what we say is let’s start more conservative, so once or twice a month, and then scale up, and see the trends and the engagement rates. And then in addition to that there’s another level you can do particular for more amateur programs as well is you want to segment your list based on the engagement, so that different segment and [sketch] different frequency. So if you think about it, let’s say you have a list of like 10,000 people, right? In the beginning you can send them all at the same frequency, but once you get some more data in, then it doesn’t make sense to send the entire list, say you normally send like three times a month. It doesn’t make sense to send the entire list three times a month. No, because maybe 2,000 of those 10,000 people open every single email. They are really engaged, they’ll open, they’re clicking and then maybe 7,000 of them really open their email every once in a while, but not every single one. And then the rest of them are almost never opening or once in a blue moon, right? And in those cases what we suggest is at least passing out the list by engagement, you can look at open rates, you can look at click rates, you can look at a combination of the factors and saying hey, the folks who are most engaged with us, we want to send them at our highest frequency. And then the once that are kind of in the middle will scale it down a bit and the ones that are very dormant let’s touch them only once in a while with our really juicy promotions. Steve: Is there a certain open rate and click rate goal that you are trying to achieve? Steve: And of course the content matters also right? X: Yeah, absolutely. And you also want to keep in mind the composition of your list is going to impact your open rates, potentially bias it. For example, if it’s an old list and not really in this scenario, but for example if a client came to us, they’ve been sending a little bit of email, they had an old list and like 50% of that list is actually very dormant, then say we do a list cleaning and take out all those people who have never opened in a long time. Then artificially open rates is going to spike up, you want to take that in context. Steve: I was just asking that question from the stand point of if the open rates start dropping to a certain number, start getting worried that you might need to clean out your list. X: Yeah, that’s one thing. Another thing is there’s many factors impacting it. Maybe your copy on the [inaudible] [0:18:47] line is not up to par. Maybe the content that you are sending is just getting old. There’re various things that can impact it. Steve: So let’s focus actually on the auto-responders because most people are lazy, and they want something just kind of automated. So let’s talk about some of the automated sequences that you advice people/stores to implement. X: Yap, absolutely. So I’ll just kind of give a list, talk a little bit about each, so obviously number one cart abandonment email, kind of a no brainer. It’s going to be very productive on the revenue front and the pound for pound is a very good email to have or a sequence even. So at the very least having one, and then you can potentially build it out to be multiple attachments. Steve: So how would you structure your abandoned sequence? What works well for some of your clients? X: Yeah it’s actually very again we definitely want to start with the first one and generally how we structure is up to three touch points. The first one going out say like four to six hours after cart abandonment, and that is just kind of a friendly reminder. Sometimes we show the products, sometime we just have straight call to action to come back. Generally we don’t offer a discount code within the first one. And then if we then additionally we do the next one which will like be a 24 hour later one and then maybe like a 48 or 72 hour later touch. Then we potentially will put a coupon code or a free shipping code or something into the second one and the third one. One thing you can do is you can do a scale. For instance on the second one you might have a 10% offer and on the third one you might have a 15% off, the logic being you might need a better discount if they gotten to that point and still haven’t purchased. Steve: So how do you prep people from gaming that system? X: If you are a savvy marketer you’ll probably game the system. What I’ve noticed is it’s not the [inaudible] [0:20:44] the audience, the customers who buy from you and all that, but in general people are not as savvy marketers as we are. The normal consumer is not really thinking that deep for most part. So we haven’t found it to be too much of a problem, but of course the key is if we do not want to train them to be in that mindset, right? So not really good answer to how to completely prevent them. Steve: What I was getting at was would you recommend not giving coupon codes for example for someone who has purchased in the past already? X: Yeah that’s one way to go about it. I say to you, one thing to look at is just doing like an A/B test on one with the coupon code, one without a coupon code. Not only to see which one performs better because most of the time the coupon code is going to perform better, but also just comparing like the margins that you are sacrificing, is that really worth the lift in the sales. Steve: Okay, and what are some of the guidelines for– like what conversion rates do you typically see from these abandoned emails? Steve: Like when should I be worried? If the percentage is too low, like when should I get worried that I’m not doing the right thing? Steve: So just be clear, you meant 15% on the people who actually click on the link and land in your site, or people who you send, period. X: On the sent; on the carts abandoned. Steve: On the carts abandoned. And this is across the entire three sequence or just like the—you are trying them at the whole sequence right? X: Yeah. Generally you are going to see the majority of conversions come off the first one. Steve: Wow, so you are saying double digits of the abandoned carts can be recovered and that’s like a standard? X: Yeah that’s fairly standard. Steve: Okay, all right. Did you have anything else to say about the abandonment series or? X: No I’ll jump to the next ones. X: So cart abandonment is one. Then also is this very based on the product, but basically kind of a reorder/cross-sale/up-sale kind of trigger. So based on the products they purchased, you want to, in a delay of course. So one that is 30 days later, 60 days later, you want to push them different products and promote to them different recommended products based around what products they purchase. In addition if your store is selling something that’s consumable, so if you are selling supplements, if you are selling anything else that’s consumable, then the reorder trigger is going to be key. Steve: What happens if your product is not consumable? Do you have any examples of reengagement series that companies that don’t have consumables use? X: Yeah absolutely. So in those cases, I’d say you want to lean towards like a cross-sale or up-sale search. You still mention the product that they purchased, and then you would recommend particular ones that either go well with that product, or they are the next step above. Yeah go ahead. Steve: No I was just going to ask, do you typically include some sort of discount for these people? How do you get them to actually come back? X: Yeah great question. So there’s two ways to go about it. Sometimes, if we are doing kind of just a generic win back if you will, we would say, “Hey here’s a discount, if you come back and shop at this site.” Other times if we are getting more specific with the product recommendations and really strilling [ph] down to like the skill level, then end and of itself, that is sort of a value add, and generally we get people coming back through that. So in those cases it’s more so like, “Hey here’s more cool things we found for you to purchase, and here’s a reminder,” rather than here’s just another coupon code. Steve: Hey everyone, I just wanted to take a quick moment to thank famebit.com for being a sponsor of the show. Now FameBit is the number one market place for You Tube influencer marketing with over 15,000 You Tubers looking to promote brand from beauty, tech, gaming, pets and more. Now videos start as low as $50, and it’s completely free to post a campaign and receive proposals from You Tubers. If you’ve listen to my podcast before, one of my guests, Emmanuel Eli, used famebit.com to make over $65,000 in four months with You Tube influencer marketing. And the best part is if you use coupon code ‘my wife quit’ at famebit.com, you will automatically get $10 off. So go to famebit.com right now and get famous You Tubers to promote your products. Now back to the show. Steve: Okay, so how I’m interpreting that is it’s not necessary to include the coupon code as long as you get a little bit more granular in what you are offering. X: Yeah and again you should probably test it for a pretty good situation. Do one with a coupon code, do one without, see if it’s generating a significantly higher amount of sales from it. Steve: Okay. And you are mentioning all of these things, but we are not really talking about implementation so to speak. Is there any particular piece of software that you use to implement these for these companies? X: Yeah absolutely. So we use quite a few, but let’s just start with kind of the basics. So you have your shopping cart, and you have your email service provider which is just the platform like MailChimp for example is very popular. You can– generally we have a combination of sending out from the email service provider, and some directly from the shopping cart, and sometimes even another kind of another app or extension or some plug-in that we would recruit and use in addition to those two just based on the unique circumstances. So let’s just take an example, for example Magento or MailChimp. That’s a pretty common combination. We would do the newsletter, the promotional campaigns, through MailChimp; we pass all these subscribers to MailChimp as well. We would set up like the post purchase welcome series, probably some prospect series in MailChimp as well. But things like the order confirmation, shipping confirmations going out through Magento, or a plug-in in Magento if you will, and cart abandonment will go through Magento as well. And then we need to then do like product reviews and like some even– potentially the product reorder ones. Generally in product reorder we like to just, it’s a little bit more tedious because MailChimp doesn’t have a great way of just doing it in one trigger. So you would need to kind of set up a few based on different skills. We can either do it that way, or we can do again a plug-in with Magento to run those. A lot of times people also use like different review software like Yappo or Reseller ratings and all that, so that’s a different story. Steve: Okay. I guess it just depends on what your platform is going to be. I was just curious if you have like a third party platform that’s one of your favorites. X: Yeah I mean, generally MailChimp is a good start in terms of just having an email service provider. They have ecommerce 360 functionality which is cool that you can target based on certain order criteria. It has its limitations, but it’s a good place to start if you have kind of a smaller list and you just want to get started with email marketing. If you want to go along the– We like to use Klaviyo because they are very focused on ecommerce unlike some of the other email service providers which cater to a lot of different niches. So their functionality is very focused on kind of a lot of the older data, and different scenarios to run into as an ecommerce shop owner. Steve: Yeah we actually started using Klaviyo ourselves and it’s extremely powerful, and I’m actually having Ed on the show at some point down the line, but let’s go back. Sorry, we took a segway there. We were talking about reengagement series. And what’s another series that you would focus on also. X: Yeah actually let me just make a small correction there. Generally we wouldn’t call what we are talking about reengagement series. We would say it’s maybe like a product follow up or something like that. In my mind the reengagement series really means a series you are running your dormant contacts through, and attempt to actively reactivate them. So the purpose of a reengagement series then is at the end of the series, for those people who did not respond, you are actually going to clean them from the list. So just a little bit of terminology there. Steve: Okay. So what would you call the list that we were just talking about? Steve: Kind of like a post purchase? X: Yeah that would be part of the post purchase series. There’s going to be other touch points within there. Steve: Okay. So when someone buys, it looks like we’ve gone through the thank you email and then the product reorder, what else goes in that sequence. Let’s finish that one off before we go on to the next one. X: So for the post purchase series, in addition to the order confirmation, shipping confirmation, that they get anyways, the welcome email, what we like to do sometimes with that is have a call to action focused around asking them to take like some sort of survey, or to manage their preferences in which they self-identify certain characteristics about themselves. So for example what kind of product they are interested in, how they are using it, maybe what kind of demographics they are in, whatever is potentially helpful for you as a store owner to start examining those contacts. Steve: What sort of questions do you ask? X: I kind of rattled a few there, but in addition to that, one thing to finish that as well is if they have a particular email frequency. So if they want to receive email once a month, once per week or never, something like that, and anything else that would really help segment. So if you think about [inaudible] [0:31:50] so that’s not necessarily something that you would self-identify of, but for example if you are selling [inaudible] [0:32:00] for example, find an implication that area giving it– you’ve been getting their birthdays, or you can do a birthday trigger on, stuff like that. Steve: And how do you incentivize them to actually fill out the survey? Steve: Okay, and then once you have this information, how do you– so then you just start creating segments for these people. How is this automated? X: Yeah absolutely. So I think with the segmentation based on some of those characteristics, is more so to get you started. So you want to continue to build a panel. So for example you want to add other criteria later on as you get more advanced such as if they visited particular product pages, what their past purchase behavior has been et cetera. So once you build out these segments, I think it’s less about automating to them, although there are other certain things you can do. But more so when you are creating sort of bigger promotions, you can be more targeted rather than sending to your entire list. You can send to different segments, you can also incorporate the data; this gets a little bit more advanced than what you needed in the beginning. But basically you can have conditional logic in the email template itself. So you can say if someone is on X segment, then they will be shown this piece of content in the email, if they are on Y segment, they will be shown a different piece of content. Steve: So what I was trying to get at is you are using the survey kind of to figure out what content is appealing to your customer as opposed to using that survey to automatically segment the list, is that kind of accurate? X: That’s correct in this case, yeah. Steve: Okay. Sorry I interrupted you again. Please go on. X: Oh no worries, I was done with that part. Steve: Okay, so survey, so we’ve got the thank you email, the survey, anything else? X: Yeah, in addition to that, if you think about the process of a customer purchasing, right? Right after they purchase your product, they are kind of on that warm and fuzzy or high if you will after you buy products. So it’s the perfect time to take advantage of that, well take advantage is negative connotation, but use that. We don’t want to take advantage of our customers. But basically if you have– some brands are super active on social media for example on Instagram, on Pinterest, on Facebook, or Twitter. It’s a good opportunity to ask for sharing, for user generated photos, something like that. So you don’t necessarily– most people after they purchase, they don’t necessarily just jump back and purchase right away again. You do get some of that actually on order shipping confirmation. Sometimes you will see immediate repurchases, after they click through those. But in general, what you want to do is you want to kind of build upon that enthusiasm and try to start building the process by getting them a bit more loyal to your brand, and getting the word out there for you. Steve: Yes, so what do you recommend for that? just sending out content, pure content, or like what would your sequence be for just keeping engaged with the customer, and then occasionally getting them sales emails. X: Absolutely. So if you envision the sequence post purchase is actually going to be super long, because how this will go, is that it will dovetail into your main email campaign. So basically it’s a couple of quick points, quick touch points and then they will be put on to your main kind of ongoing email sequence pieces which are more manual. So we want to thank them, we want to get them to share us. So maybe we mention some of the, if you have a really good blog or something, mention some of the cool piece of content they may find useful within the next touch point. And then if you have like a royalty program and some additional value add for shopping with you, mention that as well. But afterwards then they will kind of move towards your batch campaigns in your regular sense afterwards. Steve: Okay and so I know we also touched on the reengagement series, can we talk a little bit about that, because it’s different than the post purchase series that we’ve been talking about, right? X: Yeah absolutely. So the reengagement series, basically with any email list, even if you are doing very good email marketing, a portion of that list will eventually become dormant. Now of course a portion of them will just unsubscribe or complain or something, but there’s so many people who just don’t open their emails, they are dormant, but they never unsubscribe. They are still on the list. So the reengagement series is really a precursor to cleaning the list. A quick way to do this is just identify your dormant people and just remove them, but that’s not going to be the best way because you can reactivate a portion of those folks right. So it’s not going to be big portion, maybe less than 10% sometimes a little bit higher than that of those folks may still have some life in them, and would engage in your emails in the future at some point. So what we’re trying to do with the reengagement series is to identify who those contacts are. Basically what we’re doing is we’re sending them maybe like a three or four touch point series over a course of a little bit longer so maybe over a course of a month or something like that. Where the purpose of these email is to get them to open or click right. So basically if they take that action we know at least their email address isn’t completely dead. So for those folks who do take that action we’re going to keep them on our list maybe have them on a very little frequency, but keep them on our list, and then for the rest of them who are dormant, and have not responded to this reengagement series we clean them from the list. Steve: So to get them to click do you tend to use very catchy headlines? X: Yes, so the subject line is going to be key in terms of the series, because you know one of the primary things they see first is that subject line, and that’s going to be very responsible for– to kind of opens that you will get. Steve: So what are some examples of subject lines that you would use? X: Yeah absolutely so you can get as clever as you want, but let me just– why don’t I do this, why don’t I break down typically what mail content or topics should be within the series, and then that will give you an idea in terms of the subject lines right. In general you’ll see a lot of stores do this, the first sort of touch on this is a sort of what to call like ‘we’ve missed you’ kind of email. So you can see different brands be very creative with the copy here or potentially just saying, “Hey we haven’t see you in a while, do you still want to get our emails?” Something like that, and with that one you’re not really offering too much incentive yet, it’s a very light touch point, just reminding them you’re still there, maybe saying, “Hey here are some of our new products since the last time you potentially visited.” And getting them to open the email. The second one– and series could potentially go wrong, but generally we keep it to a three or four touch points. Second one would be something that’s really screaming to them on the discount front right. So something really juicy that’s on beyond your normal discount, say like if you offer a lot of five percent off discounts you want to offer like a 10% on in here in this case. And you want to at least have the illusion of being it being personalized, sometimes based on technologies you use it’s hard to get true personalized expiring coupon codes within each one of these emails, but for this one it’s what we call like a ‘deep discount’ sort of email, where we’re playing on a different angle to try and get them to reengage right. So we’re saying here’s a really juicy discount, click through, use the discount etcetera. Steve: Is– oh sorry go on. Steve: No, I was just going to ask is reengagement series in terms of when to send it out, is this like an automated thing or is it something that you manually kick off occasionally for people? X: Great question, so generally what we do is we start the first one as a manual, because a lot of time there’s a lot of dormant folks on a list when you’re starting the series. So we do a manual one for the bulk of the lists are dormant, and then from there we want to automate it. And depending on the technologies you use it could be a little bit difficult to automate, because really a true automated sequence for this is if they fall through all of the emails and don’t reengage at all, then they automatically get unsubscribed right. Sometimes the ESP, the email service provided doesn’t have that functionality where you can say unsubscribe them. So in that case maybe put them on a separate list that you go in every once in a while and unsubscribe. So ideally it would be automated after the first sort of manual sequence, it is kind of a combination depending on what you’re working with. Steve: Sorry I interrupted you before you were going to talk about the third touch point. X: Yeah sure so the third touch pint is one– third/fourth sometimes we do four sometimes we do three. Its’ really being very straight forward and saying, “Hey if you don’t respond in some way we’ are just unsubscribing you from the list.” So it’s just black and white saying, “Hey we haven’t heard from you, it doesn’t seem you’re interested we’re going to unsubscribe you unless you click on this or do this action.” So it’s pretty much like a last ditch sort of effort for it. And then a potential fourth one– so like if you imagine third one saying like, “Hey we’ll unsubscribe you in seven days if you don’t do action,” then a potential fourth one would be like, “Okay, you’re unsubscribed, but here’s a chance to re-subscribe if you ever want to in the future.” So it’s kind of the same part and parcel you can combine into one if you want. Steve: Okay, so we’ve talked a lot about the auto responders, do you have any kind of advice on how to structure your regular marketing campaigns? And here’s a specific question relating to that, do you advice writing your emails on a very personal tone, or use more professional template like you see some of the big buck stores using? X: Yeah, that’s a question that in this case is going to be really– I say it really depends a lot but this really does depend right, run A/B test and that’s the only way you’ll find out. So whether it’s a very professional a lot of graphics you know super optimized for images off all that, with the headers and the footers, and navigations, and all that or it’s like more of a plain text maybe just in light [inaudible] [0:43:29] elements, run some head to head A/B tests and you’ll find out. Sometimes it’s also important to not just base your decision on one test, because a lot of times like for example, if you’re sending out regularly kind of these polished emails, and all of a sudden you send text one, you’ll probably going to get much higher engagement rates. But that might be [inaudible] [0:43:52] just because people respond to things that are [inaudible] [0:43: 55], so if it’s something that’s outside the norm from what they’ve been getting, sort of juicy artificial like in the engagement rates. If you test a couple you find one is a clear winner, then I ask you stick with it. Steve: Okay, I’m just curious in your experience though for some of the smaller shops what has worked? X: Great question, so in general we get better performance from more polished, but on that note you have to kind of be cognizant of not having like too much images where if it’s images off people just see blank email, and certain architectural elements, where in general we see kind of better click rates where we’re giving them more options. Of course you have the main call to action whenever you’re sending out email based on the topic of your email, but having the ability to have like header navigation with different categories, or footer navigation, that generally increases aggregate grades. Steve: Okay, and then when you’re trying to optimize these campaigns, you talk about click rates and open rates a lot, but do you factor in the actual conversions? Steve: So you don’t really care– that was a damn question actually, but what I meant by that was what is your main metric in the beginning when you’re focusing on these emails, do you just look at conversions irrespective of click through rate and open rate for these emails? X: No everything is has been taken to context, there’s a lot of different metrics you have to analyze to get the full story right. For example open rates what it’s telling you is primarily is A on that particular email like is our subject line good, is our pre-header good, have we been doing a good job up until that point in terms of having diverse content and keeping people engaged. Click rate tells us more about– rather we separate click through opens, click through send because they tell a little bit of different story as well. But in general how many people are clicking the emails are– that’s dependent on the content of your emails; it’s dependent also a lot on the layout and how you’re coding your emails, and in the design and other factors around that. And then of course conversion rate is the [embalm deal] at the end of the day, because you can do the most beautiful emails in the world, if they’re not converting then they’re not doing much for you right. On conversion rates of course the key is to make sure your attribution is tight, because if you for example just Google Analytics, a lot of the times we’re seeing Google Analytics just terribly under attribute what email is doing by the coders magnitude. Steve: Wait, wait, why is that, like if you’re tagging your links why would that be the case? X: Yes, so a lot of times email gets kind of under attributed in the sense a lot of times people would be clicking on email and then they either are converting on a desktop later, for example they click on mobile, they convert on different browser later, or they– on notify of the sale from email and they wouldn’t have come to the site anyway if they didn’t get the notification, and then they come at a later day directly to the site and click through stuff like that. So in general we’ll get that portion that clicking through and ideally purchasing which is a portion you’ll see. At the same time there’s some issues around that, and what we recommend, actually the way we track the metrics is kind of– it’s a bit manual in some cases, but what we like to look at is different sources, so Google Analytics is one source. If your email service provider has their own web tracking we also take into account that, sometimes for example say for Klaviyo they just happen that they one. And then in addition to that if you’re using coupon codes, and even like email coupon codes, so you’re not promoting anywhere else, taking a look and comparing that data against the rest of the data, because sometimes you see some discrepancy. Steve: Okay and I wanted also your opinion on using a lot of images in emails as opposed to just text, like you kind of touch on that, but I was just curious what your recommendations are? X: So nowadays – most of the time [inaudible] [00:48:21] Gmail and whatever you’re opening your email with they’re getting better with just showing images, for example Google and this wasn’t that recent ago, but they rolled out kind of the default show images on and have been routing all the images to their own servers to be able to that. So it’s getting better in terms of just show all your images correctly, but there are still substantial amount of our clients that are going to default with image off, so we are working on, which means if you are heavily-heavily image based in your emails, then a lot of the times your email might just show up with a couple of text and a blank email which is not good. So we like to have a combination where we are using images, because a lot of products you need that visual to drive people to come back, but at the same time we’re focused on coding elements in HTML whenever possible right. So you’ll see with our [inaudible] [0:49:24] for example the header navigation, the footer navigation, and anywhere where there’s copy for most part, that’s going to be based in HTML and hot coded in. And then the places where we can avoid it with the actual images, we’ll have like styleless all text, or kind of just a space for the image so that you can clearly tell that if you turn your images on you’ll see it. So it’s a combination, you don’t necessarily don’t want to do any images, but you definitely don’t want to do just a pure image sort of layout which actually you know I see that a lot with big time retailers. Steve: Yeah, I know I do too, that’s why I was asking yeah. X: And I think– and again maybe they do their own tests and they found that just works for them, but one of my theories is I think a lot of times is just the bureaucracy, they got creative departments that want pretty emails and the performance is secondary. Steve: This is my opinion, my opinion is that a lot of these businesses don’t actually split test their emails right, and so that’s why I was just curious. X: Oh yeah, I don’t want to go into specifics, but some of these big retailers, they may not even be segmenting that well let alone split testing, so yeah just because they’re big doesn’t necessarily mean they’re masters at this particular channel. I mean a lot of them do a really good job, but there’s also a lot that don’t. Steve: Okay, real big question for me also is how do you escape the promotions tab, do you have any tips there? X: Yeah so I think it’s less so about escaping it, because ultimately Google is getting smarter and getting smarter, so it’s less about escaping as more so about just keeping your users engaged. In addition into kind of doing your normal promotions you’re adding in less salesy emails, you know maybe craft a newsletter, things along those lines. I remember when the Google firm came out the tabs, the whole industry was kind of in uproar, which was when they brought that priority inbox and all of that. Every time Google or Gmail does something crazy people freak out about it, but at the end of the day if you look at the stats there’s like some spikes and drops in the beginning, and then [inaudible] [0:51:49] I think they’re all click rates are just like a little bit below prior. At the end of the day I don’t think there is a strategy to try to escape the priorities tab, but rather do everything you can to keep your customers engaged. Steve: Okay, all right I think those are all the questions that I’ve got, I mean we covered a whole bunch of stuff in this interview. Hey X thanks a lot for coming on the show, I learned a lot and where can people find you if they’re interested in getting consulting, or some advice about their email campaigns? X: Yeah absolutely, so the best place to be is just our website which is www.essesnceofemail.com, or if you just want to shoot me an email as well my email is probably the simplest one ever, it’s just X@essesnseofemail.com. Steve: Awesome X, well thanks a lot for coming on the show man really appreciate your time. X: Sure no problem, I enjoyed it. Steve: Hope you enjoyed that episode, X is one of my go to guys when it comes to email marketing specifically for ecommerce. And if you could not tell already email for ecommerce versus email for blogging or selling info products is actually quite different as there many more facets to consider when selling physical products online. For more information about this episode go to Mywifequitherjob.com/episode83, and if you enjoyed this episode please go to iTunes and leave me a review. It is by far the best way to support the show, and please tell your friends because the greatest compliment that you can give me is to write a referral to someone else either in person or to share it on the web. Now if you’re interested in starting your own online business, be sure to sign up for my free six day mini course, where I show how my wife and I managed to make over 100k in profit in our first year of business, go to Mywifequitherjob.com and sign up right there on the front page. Once again I also want to thank Bigcommerce for sponsoring this episode. Bigcommerce is one of the best shopping carts that I recommend if you want start your own online store without having to worry about anything technical. So everything from design, to sourcing, to payment processing, is all built in so all you got to do is populate it with the products you want to sell, and you can literally start you store in a matter of hours. Simply go to Bigcommerce.com/mywifequitherjob, sign up and you’ll instantly receive one month free, once again the URL is Bigcommerce.com/mywifequitherjob.